Monit config settings for VestaCP on Centos7. This short guide will show you how to install (links) Monit on CentOS 7, Ubuntu, Debian etc. This guide also contains Monit configuration settings you can just paste into your Monit config settings file. The guide focuses on VestaCP which is running on a CentOS 7 Server. Related : Vultr Tutorial – Installing CentOS 7 and Initial Server setup guide for windows users . The following are important links to help you at any time when you are lost or stuck. If you haven’t installed monit yet, the following guides will help you install it on centOS 7 , Ubuntu and other Linux Distros. Linode guide – In the same article, you will cover monit installation on : Arch , CentOS , Debian / Ubuntu, Fedora. ITzGeek guide – I mostly used this to install on my CentOS 7. Steven B guide – If you are running Ubuntu this guide will show you how to install Monit on Ubuntu. 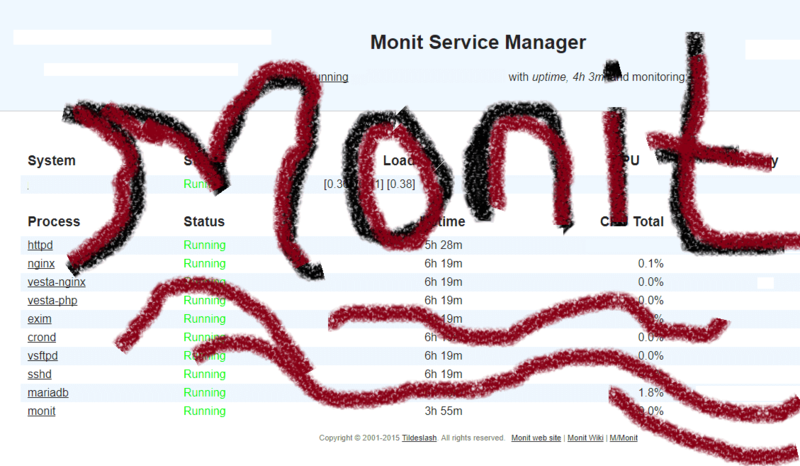 It also has ready configuration files for you that you will just import into your server to setup Monit Checks. I was switching back and forth between the first two articles. After configuring the Monit daemon actions, you may feel a bit lost on where to put the config files. That’s the only part this article wants to cover. This is for you if you are using | VestaCP on Centos7. You will also get ready config settings for VestaCP processes such as Nginx, Apache, MariaDB and other processes listed further down below. Once you have successfully installed monit. Successfully set up the daemon frequency, server port, email and other settings, you may come back here to get the steps if you are using VestaCP on Centos 7. After installing Monit, you may want to use the web Interface. To access it you need to go to http://your.ip.address:2812 eg http://127.0.0.1:2812 . If you have a firewall installed on your server, you will need to enable port 2812 for it to be accessible on your browser. On VestaCP how to enable the port is shown below. Step 3: Click on the Green + button. When you hover on it, you will see the button become add rule. Step 4 : Adding the rule : Use the following as your rule settings . Then click Add . If you are running VestaCP as your panel and you have installed Monit to monitor your server processes, the following are the configs for monitoring and restarting various Vesta Panel processes on CentOS7. Add the configurations just before the includes section as shown in the screenshot below. These Monit configs will monitor and restart upon failure, the following processes for VestaCP. After you ssh into your Centos server. Edit the Monit configuration file (/etc/monitrc). In this file you will add all the configuration files shown below. start program = "/usr/bin/systemctl start httpd"
stop program = "/usr/bin/systemctl stop httpd"
start program = "/usr/bin/systemctl start nginx"
stop program = "/usr/bin/systemctl stop nginx"
start program = "/usr/bin/systemctl start vesta"
stop program = "/usr/bin/systemctl stop vesta"
start program "/usr/bin/systemctl start exim"
stop program "/usr/bin/systemctl stop exim"
start program = "/usr/bin/systemctl start crond"
stop program = "/usr/bin/systemctl stop crond"
Tip : In nano, press CTRL V to go to the next page or CTRL Y to go to previous page instead of pressing up and down arrow keys which only go one line at a time. Right click your mouse or mousepad to paste into nano editor.